We have renovated several bathrooms in our homes over the years. 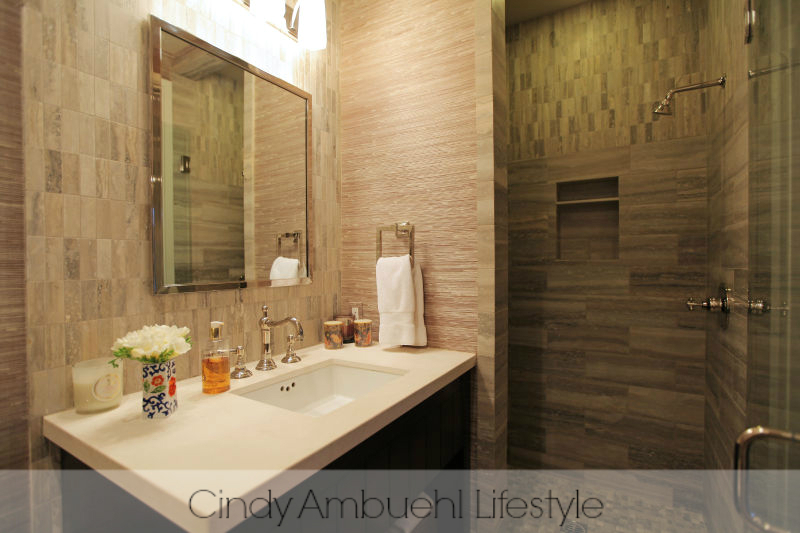 Choosing hardware, tiles, fixtures, and cabinetry was the favorite part of the renovation process. 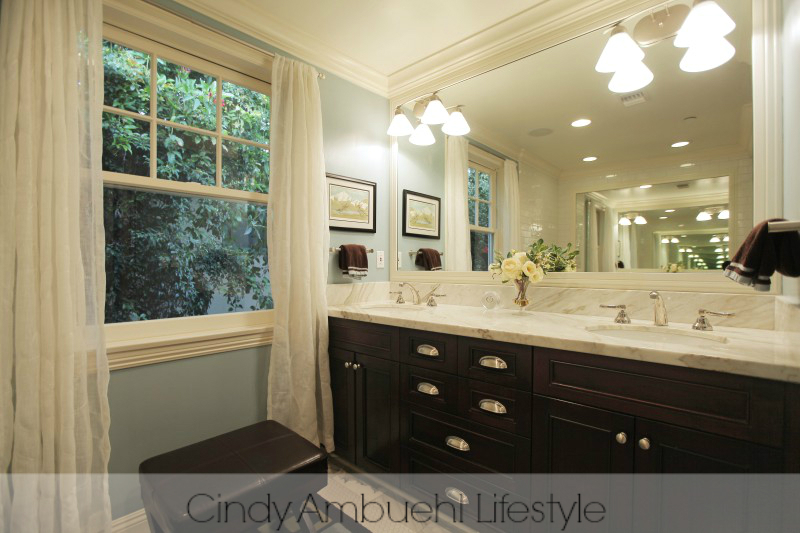 But each bathroom remodel started out with an initial inspiration photo, or two, or three! 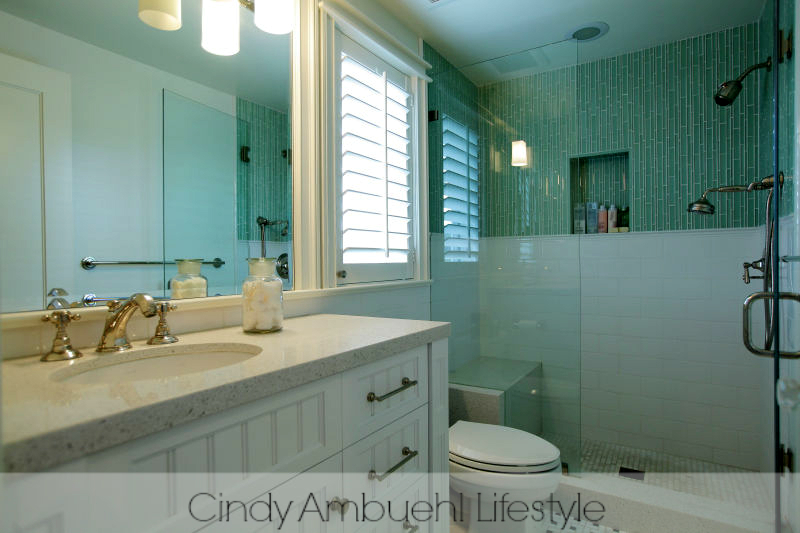 I’ve put together a drool-worthy collection of gorgeous and Glamorous Bathroom Ideas all from a wonderful new site that I was recently introduced to: Cindy Ambuehl Lifestyle. 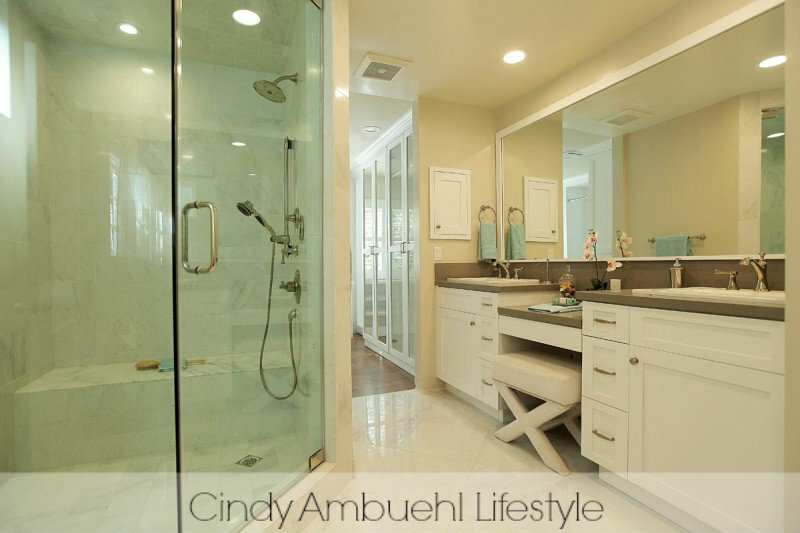 Cindy is a former actress and now is a Beverly Hills, CA luxury real estate agent. She is also a mom of 7 boys! Cindy’s site is filled with beautiful photography, decorating ideas, home tours, and lifestyle tips. I’m excited to share a bit of her blog with you today. Let’s take a look at these glamorous bathrooms! The links below each picture will take you to the entire luxury and celebrity home tour if you want to see even more beauty! 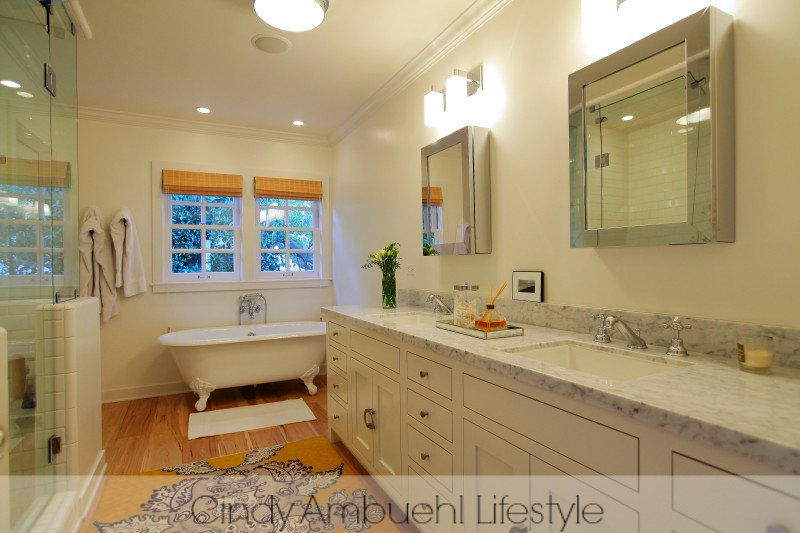 This bathroom combines an eclectic blend of traditional and modern styles. Mixing cabinet colors does not have to be reserved for only the kitchen. This master bath pairs white cabinetry for the dressing room side of the room with a rich dark espresso stained double vanity, topped with white marble. This amazing bathtub becomes the focal point of neutral colored bathroom. Notice the stone walls, the herringbone flooring and the detail to a repeated pattern of circles used in the hardware, windows, and lighting. Create a spa like experience in your bathroom with a calm and cool color palette and a bamboo tiled shower surround. Take my breath away. Who wouldn’t love relaxing in this stunning tub next to a crackling fire on a chilly winter’s evening? 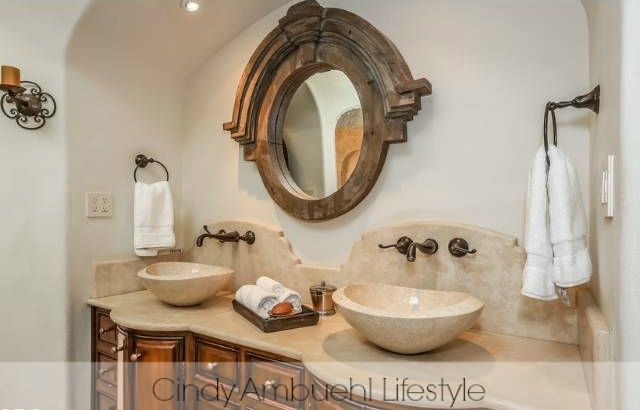 Escape to the Europe with this Spanish styled master bath draped in imported stone and marble. 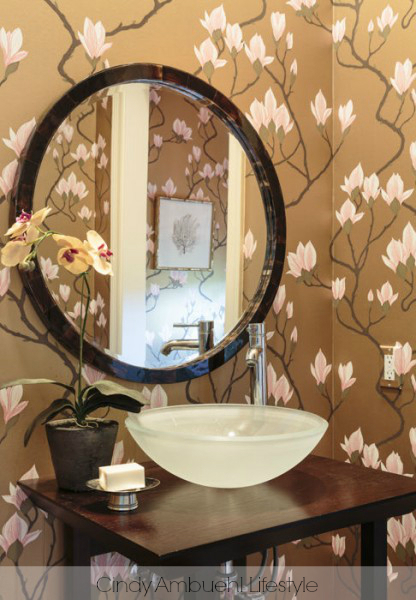 Add interest to a powder room with wall paper and a vessel sink. Aren’t those bathrooms just stunning? You can find more beautiful inspiration at Cindy’s lifestyle blog. Cindy has partnered with PS Arts, a non-profit organization in Los Angeles that partners with public schools to provide art, theater, and music education. Their mission is to improve the lives of children in under-served public schools and communities. This is such an important cause. Art education is rapidly being cut from our school systems. My education was in Communication Arts & Design, and I couldn’t imagine not having art classes growing up and I’m so happy that my children’s schools still provide art education. Express Yourself is their annual fundraiser, previously chaired by Lisa Kudrow from Friends. 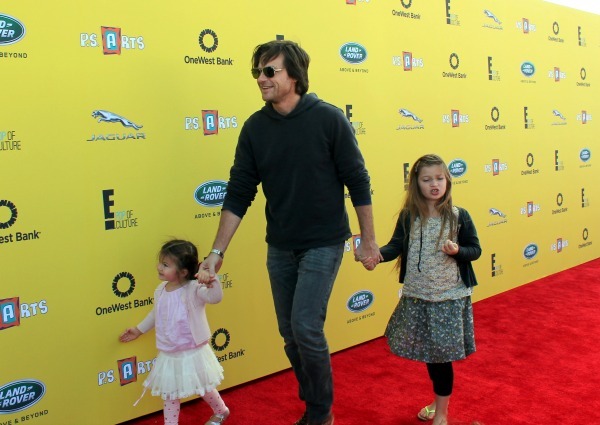 Many celebrities help to host and attend the event with their families. Cindy (pictured below) and the Duck brand teamed up to provide a fun booth for the kiddos to create their own crafts with Duck products. and Eva La Rue and her daughter helped out too. 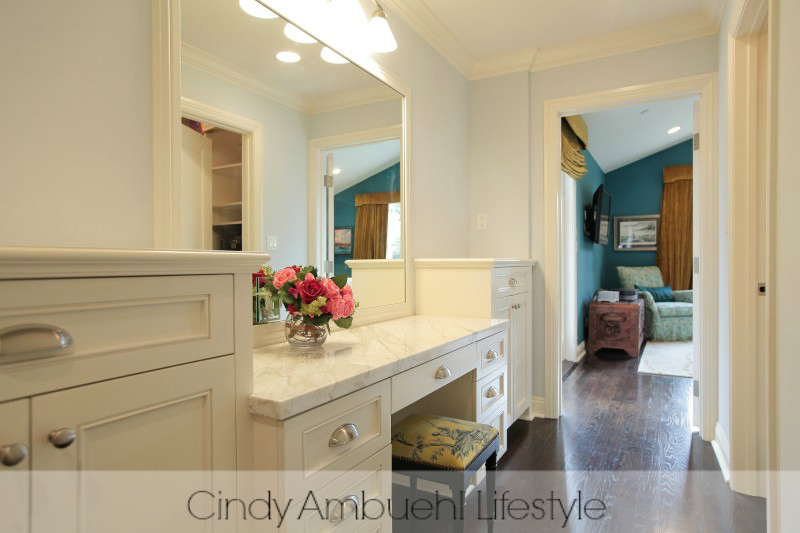 Feel free to visit Cindy’s blog at www.cindyambuehl.com or connect with her on Facebook, Twitter, YouTube, Instagram, Pinterest. Disclosure: This post has been brought to you in partnership with Cindy Ambuehl. All expressed opinions are my own.